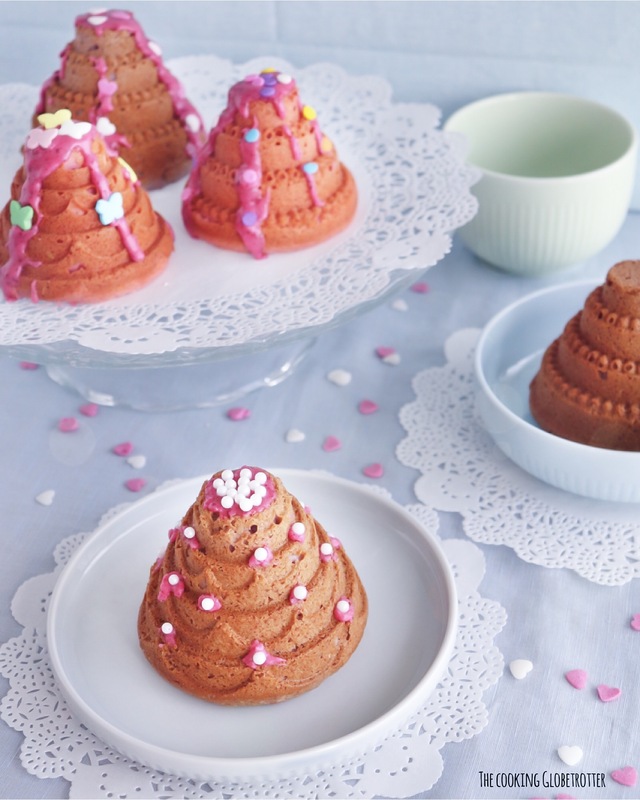 I made these mini cakes to celebrate the birthday of my daughter’s teacher. The children were terribly excited! To make them more fun I coloured the dough pink and purple. Decorated with a simple sugar/lemon frosting turned pink by some blueberry powder. Some colourful sprinkles and it looks lovely, doesn’t it? I adapted a recipe of a simple Italian breakfast cake, called ciambella, by using buttermilk instead of milk and pouring the dough into this beautiful moulds. They do make all the difference. I love the nordic ware (not affiliated) baking tins, they are incredibly durable and really non-sticking, only need to butter them when using chocolate chips or other sticky fillings. So, you can use this recipe for a whole cake as well as for muffins or mini cakes. 1. Preheat the oven at 180° C.
2. Whisk the butter (120g in chunks) and the sugar (200g) together. 3. Add the (2) eggs. 4. Add a splash of vanilla extract. 5. Mix the flour (300g) and baking powder (16g) to it, alternating with the buttermilk (160g). 6. Don’t overmix, let just the dough come together. 7. Optional: add some gel food colours to the dough. 8. Pour in your baking tin or moulds. If you want to decorate them, mix 1-2 tablespoons of lemon juice with 3-4 tablespoons of icing sugar so that the consistency is still runny but not too much. If you want to colour it, you can add fruit powder or food colours. Pour it on the cake with a small spoon and then place the sprinkles on it. Whisk the butter (120g in chunks) and the sugar (200g) together. Add a splash of vanilla extract. Mix the flour (300g) and baking powder (16g) to it, alternating with the buttermilk (160g). Don't overmix, let just the dough come together. Optional: add some gel food colours to the dough. Pour in your baking tin or moulds. Need something fancier? Check out my rainbow cake tutorial!